Grade your students’ tests and quizzes with confidence and with ease using our Grade 1 Video Teacher Kit, made specifically with you, the classroom supervisor, in mind! We know that with a schedule as busy as yours, you want to save time wherever you can; that’s why our answer keys provide you with both the answers and the point values, making your job as simple as possible! 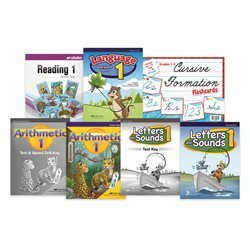 Included in this kit are Reading 1 Answer Key, Letters and Sounds 1 Teacher Key, Letters and Sounds 1 Test Key, Language 1 Teacher Key, Arithmetic 1 Teacher Edition, Arithmetic 1 Tests and Speed Drills Key, and Cursive Formation Flashcards—everything you need for a smooth and successful school year!